Every year I do a retro CD for the holidays that goes to friends and family. Whatever expertise in popular music that I do have is from the eighties, so I go forward one year in that decade—that means that this year I’m doing 1988. There’s a story behind every year’s CD, and this one involved a 1985 Trans Am. So, I decided I would draw a 1985 Trans Am dashboard and thus this blog post. Updates for the 1985 Pontiac Firebird Trans Am included a restyled nose with built-in fog lamps, new taillights, fake hood louvers replacing the traditional power bulge, and full rocker and quarter panel extensions. A new WS6 suspension package was made available for the Trans Am, which included gas pressurized shocks and 16-inch wheels with P245/50VR16 Goodyear “Gatorback” tires for a $664 price tag. Inside, all gages now had graph patterned backgrounds, and a new UT4 “Touch-Control” optional stereo was available. 1985 Pontiac Firebird Trans Am dashboard. For 1985, the standard Trans Am powertrain was a 165 bhp 5.0 liter/305 ci V8 with a Rochester four-barrel carburetor paired with a five-speed manual transmission. The top of the line engine was the $695 LB9 fuel injected 5.0 liter/305 ci V8, with 205 bhp—but that was only available with a four-speed automatic transmission, yielding a zero to sixty time of about 7.5 seconds. If you wanted the five-speed manual transmission, the best engine choice available on the Trans Am was the 190 bhp H.O. V8 with a four-barrel carburetor. Mileage with the standard powertrain was 15 city/24 highway by the standards of the day (14/22 by 2017 standards). With a 15.9-gallon fuel tank, a Trans Am owner could expect a range of between 255 and 280 miles with a 10% fuel reserve. Standard exterior and mechanical equipment on the $11,113 Trans Am (about $26,600 in today’s dollars and close to what a base 2018 Camaro costs) included power brakes (front disc/rear drum), hidden electronically-controlled halogen headlamps, dual sport mirrors, an all-glass rear hatch, a rear deck lid spoiler, and P215/65R15 steel-belted radial tires (still a readily available size) on “deep-dish” 15 x 7 wheels. Inside, reclining front bucket seats and side window defoggers were included. Options included T-tops ($825), a louvered rear sunshield ($210), air conditioning ($630), Recaro bucket seats ($636), and cruise control ($175). Trans Am page from the 1985 Pontiac brochure, linked from the Old Car Manual Project’s amazing brochures pages. The 1985 Trans Am sold reasonably well, with 44,028 sold—about 46% of total Firebird sales. Third-generation Firebirds have a strong following, and 1985 Trans Ams make regular appearances in the Hemming’s Motor News classifieds and on eBay Motors. As I update this post in December 2018, there’s a Blaze Red 1985 with 4,400 miles for sale for $24,900. According to Hagerty’s valuation tools, all the money for a 1985 Trans Am with the LB9 in #1/Concours condition is $23,300, with a far more typical #3/Good car going for $8,800. Please make mine Black, please—I think. The last of the rear wheel drive Grand Ams came in 1980. Unlike in 1978 and 1979, the sedan was no longer available—only the coupe remained. The standard engine in non-California cars was the L37 155 bhp 4.9 liter/301 ci V8 with four-barrel Rochester carburetor and electronic spark control (California cars got the Chevrolet-sourced LG4 150 bhp 5.0 liter/305 ci V8). The only transmission available was a three-speed Turbo-Hydramatic TH200 automatic transmission. Mileage was 17 city/25 highway by the standards of the day. With the 18.1-gallon fuel tank, range was about 340 miles with a 10% fuel reserve. Period performance tests of the Grand Am are hard to come by, but 0-60 mph likely came in around 9 seconds. New features for 1980 included a revised soft-fascia front end with three sections per side, an Ontario Gray lower accent color for the exterior, a silver upper body accent stripe, larger wraparound black-out tail lamps, and larger front and rear stabilizer bars for the optional ($45) Rally RTS handling package. Standard exterior and mechanical equipment on the $7,299 car (about $24,500 in 2018 dollars) included dual sport mirrors, dual horns, power steering, power front disc/rear drum brakes, and 205/75R14 black sidewall radial tires (a size still readily available) on Rally IV cast aluminum wheels. Inside, Grand Am purchasers could expect cut-pile carpeting, custom vinyl front bucket seats with center floor console, rally gages with clock embedded in a brushed aluminum instrument panel, and a custom sport steering wheel. Available exterior and mechanical options included a power sunroof—either metal ($561) or glass ($773), dual remote sport mirrors ($73), Soft-Ray tinted glass ($107), and electric rear window defroster ($107). Inside, air conditioning ($601), power door locks ($93), power windows ($143), a six-way power driver’s seat ($175), a tilt steering wheel ($81), automatic cruise control ($112), and an AM/FM stereo radio with stereo cassette player ($272) were all available. A nicely configured Grand Am could easily push past $9,600—real money in 1980 and over $32,000 in today’s dollars. 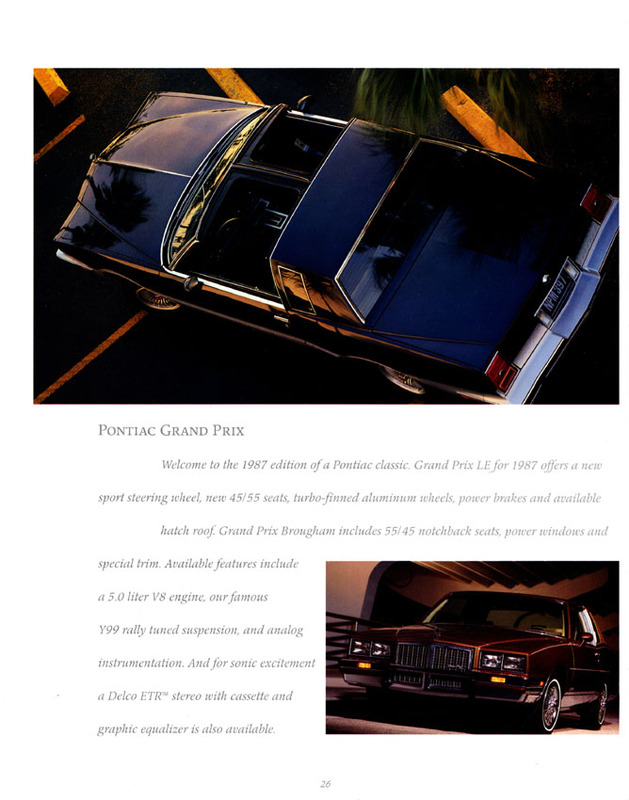 Page from 1980 Pontiac full-line brochure, linked from the Old Car Manual Project’s amazing brochures section. 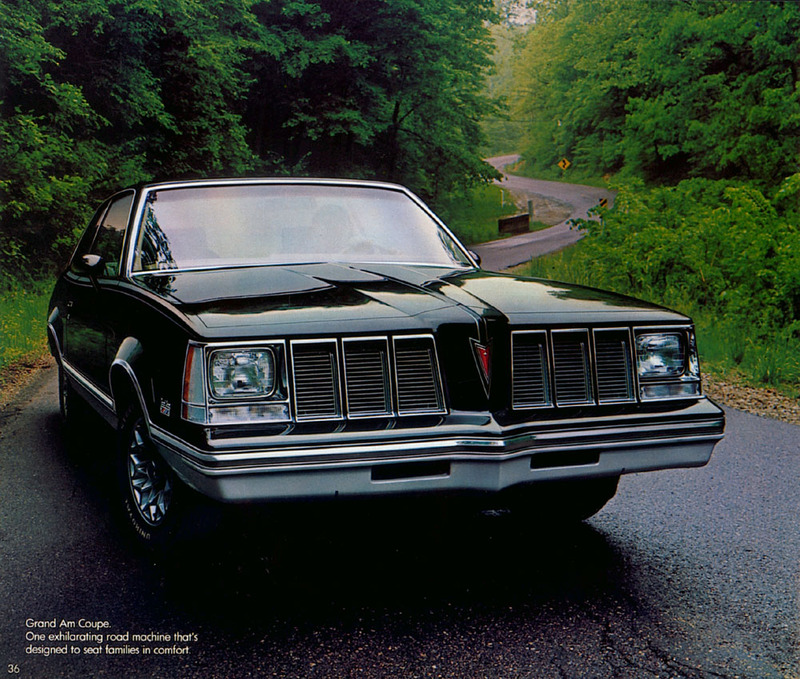 Grand Ams didn’t sell at all well in 1980—Pontiac moved only 1,647 of them, after selling almost five times as many coupes only two years prior in 1978. Despite this, Pontiac would not give up on the Grand Am name—it would be back in 1985 as a small front-wheel-drive coupe. Most of the Grand Ams being collected are the larger and more powerful first-generation Colonnade versions sold from 1972 to 1975. You do occasionally see second-generation Grand Ams for sale in the Hemming’s Motor News classifieds and on eBay Motors. I haven’t seen a Grand Am from this generation for many years. Make mine Starlight Black, please. Other G-bodies covered in this blog include the 1981 Oldsmobile Cutlass Supreme coupe, the 1983 Chevrolet Malibu sedan, and the 1984 Buick Regal Grand National coupe.